Sarah comfortably straddles both the classical and folk harp worlds. 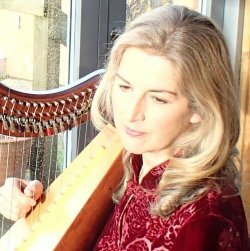 After leaving the Royal Academy of Music and doing stints with the Bournemouth Symphony, BBC Symphony, and Ulster Orchestra, among others, she began exploring medieval music in 1997 with her husband Phil, with whom she performs. They have both been involved with research into the medieval history of the harp and bagpipe in England. She is now director of the Cornwall Harp Centre on the spectacular coast of Cornwall. She has numerous books and CDs available through the Centre. Besides teaching, performing and publishing, Sarah is an ardent researcher on medieval music and has even restored antique harps. She discovered the forgotten harp-lute and the neglected Regency-era repertoire of the 19th century. Sarah loved her first year with us in 2014, returned in 2015 and we just had to ask her back! She has brought her husband Phil, who will perform in concert with her. Her recent endeavors include writing a ‘classical’ style piece for lever harp and chamber choir, which was performed in London last April. Set as songs with harp accompaniment, it has 8 medieval English texts inspired by the changing seasons. Singer and harper Dominique Dodge of Vermont and Cape Breton, Nova Scotia is making her second appearance at Somerset. 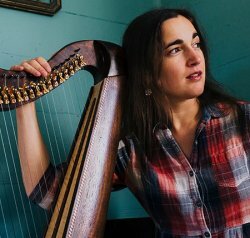 Deeply grounded in the music and song traditions of Cape Breton, Ireland, and Scotland, Dominique has a passion for melody-driven dance music and responsive, rhythmic accompaniment, as well as for songs, airs, and 18th century harp music. A former Fulbright Scholar, Dominique has an MA from the University of Limerick in Irish Music Performance and a BA Honours in Scottish Music from the Royal Conservatoire of Scotland in Glasgow. She is also a dedicated learner of Scottish Gaelic. As well, Dominique has extensive experience in traditional arts education and maintains a busy and vibrant teaching practice. She has been performing, recording and teaching traditional music on both sides of the Atlantic for over ten years. She has been a teacher at the New Hampshire School of Scottish Arts (NHSSA) as well as OSAS (Ohio School of Scottish Arts ) and has been an instructor with the Integrated Arts Academy in Burlington VT, with a guiding hand on the Young Tradition Vermont youth group. Under her direction, our Youth Harp Program, has really taken off and she is back for the 3rd consecutive year. Sometimes a particular experience will connect with existing skills in such a way that a person will embark in an entirely new but inspired path. Such is the case for Edie Elkan, who with a strong background in music, experience as a teacher of piano, and an early grounding in playing the harp, found herself first, returning to the harp to assuage her own grief, and then discovering that the harp was being used in medical environments which in turn led her to found Bedside Harp in 2002, a New Jersey, hospital-based harp therapy program. 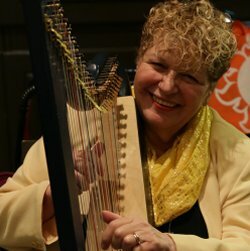 In 2005 Elkan was recognized by the Society for the Arts in Health Care for her work at the Robert Wood Johnson University Hospital’s cancer center, where, in a research project, she discovered that patients who listened to live harp music while receiving chemotherapy were less anxious that those patients who did not. 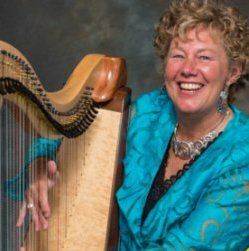 Edie has published Everything You Ever Wanted to Know (about Harp Therapy) and her master’s thesis: The Edie Elkan Method of Teaching Folk Harp as an Instrument of Healing. Also available is a 4-set CD Oodles of Noodles, a recording of a workshop on ‘noodling’ presented by Edie in 2006. Martha is ‘gracious and gifted’ and plays with ‘joie de vivre,’ and is ‘an absolute gem of a performer." In 2003 Martha was invited to tour the US with the Chieftains, and along the way garnered plenty of applause just for herself. 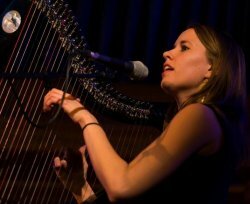 Touring the US on her own under a grant from the National Endowment for the Arts, she has also competed in the Annual Edinburgh International Harp Festival on a Special Opportunities Grant from the New York Foundation for the Arts. With a deep background in many forms of music from classical to rock and roll, Martha has a BA in Music and is an experienced teacher and avid advocate of arts-in-ed and has presented programs for k-12 integrating music, history, Shakespeare, poetry and physics. Martha’s theatre training and creative movement work includes intensive studies with Shakespeare and Co. and The Celebration Barn Theatre. An actress, storyteller and poet, her live performances go “beyond concert” and into the realm of a one-woman show. Martha has also delved into working with a variety of ensembles, arranging and performing many of her original works with symphonies, vocal ensembles, hand bell ensembles, and other groups. She has numerous CDs, among them the intriguingly titled, The Wild Harps of Ireland and Songs from the Stones (which does not cover the Rolling Stones!). Check out this video of Martha's songwriting and performing acumen at our 2013 festival. Maeve Gilchrist thrives on innovation and improvisation - what she fondly calls "my musical patchwork quilt." Steeped from an early age in both classical and traditional music, Edinburgh-born Maeve Gilchrist discovered jazz in her late teens which she pursued at Berklee School of Music in Boston where she also studied voice, percussion and Latin American music. She subsequently became Berklee's first lever harp instructor. Maeve has stretched the traditional boundaries of the harp and has been credited as an innovator of the Clarsach (Scottish Harp) due to her chromatic style of playing and improvising. Now living in New York City, Maeve is touring regularly with her own project and giving workshops worldwide. Performance highlights include the Tanglewood Jazz Festival, The World Harp Congress, and the Celtic Connections Festival. You've seen her on the Somerset stage in numerous artistic configurations with other artists, including with dancer Nic Gareiss. She collaborates and performs with so many artists across so many kinds of musical genres that we have a hard time keeping up with her! She now has four CDs out as well as several instructional books published by Hal Leonard Music. Joyful, centered, and a consummate musician are words that describe the presence and playing of Robbin Gordon-Cartier. Dedicated early to the study of the harp, Gordon-Cartier spent long summers as a young harpist in Ireland studying at the Royal Irish Academy. Since then she has appeared nationally and internationally everywhere from Carnegie Hall to the National Symphony of Santo Domingo, at events honoring Lord Guiness, Cicely Tyson and Sir James Galway. She plays frequently at churches and gospel events. Robbin teaches an extensive and very successful harp program in the East Orange School District's Cicely Tyson's School of the Performing Arts where she works to bring the harp to the attention of a wide variety of young people, busting stereotypes. Her Cicely Tyson harp ensemble will be playing in our Friday lunchtime concert. 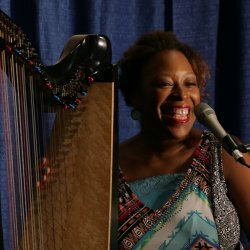 Robbin led our Youth Harp Program in 2014 and 2015 and has led the Teacher's Symposium for 2 years. She has joined the faculty of Kean University in Union, NJ as Concert Artist/Adjunct Harp Faculty. Robbin has a CD out, Just As I Am. 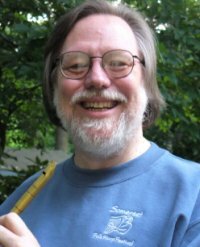 Dennis Gormley is a talented multi-instrumentalist who has been a fixture on the Philadelphia folk music scene for over 40 years. He has been performing traditional Irish music with his wife (and festival director) Kathy DeAngelo as McDermott's Handy since 1978. He is a well-respected teacher of traditional music and teaches at the young musicians session at the Irish Center in Philadelphia. He and Kathy anchor NJ's longest continuously running Irish session, now at the Treehouse in Audubon NJ. Dennis and Kathy were inducted into the Mid-Atlantic Comhaltas Hall of Fame in 2014 and into the Delaware Valley Irish Hall of Fame in November 2015. McDermott's Handy has two CDs, Come Take the Byroads and Bound for Amerikay and Dennis has many other recording credits in other genres with other artists as well. Besides presenting non-harp workshops at the festival, you'll frequently see Dennis being busy with festival logistics as part of our very dedicated festival staff.